As political actors battle to keep their political dreams alive, the Nigerian political space has been rocked with the waves of mass defections by those who have had their hopes of being their party`s flag bearer dashed having lost the ticket to more politically favoured individuals. Delta State which is popularly known for its inclination in political affairs is not left out in this political tussle as information made available to SecretReporters reveal that Mr Solomon Awhinawhi Peoples Democratic Party (PDP) stalwart who contested to represent Ughelli/Udu Federal Constituency for the National Assembly House of Representative primaries and lost woefully to his arch-rival Hon. Samuel Mariere has defected from the PDP to Social Democratic Party (SDP) as he feels cheated and embittered by the results of the primary elections. SecretReporters gathered that the electoral primaries held at all Federal constituencies in Delta state were not without the usual political higi-haga as it was reported that the elections at Ughelli constituency 1 had about six contenders with the major aspirants in persons Samuel Mariere and Awhinawhin. Hon Samuel who represents Ughelli 1 in the State House of Assembly having scored 168 votes out of 412 accredited votes defeated his closest contender and incumbent Awhinawhin who scored 157 votes, where he was declared winner to clinch the PDP ticket for Ughelli north/south and Udu federal constituency. SecretReporters also learnt that supporters and angry mobs allegedly belonging to the camp of Hon Awhinawin who saw such loss as an injustice and an end to their cash flow started shooting sporadically, which led people to scamper for safety with the area turning into a fight for all showdown. 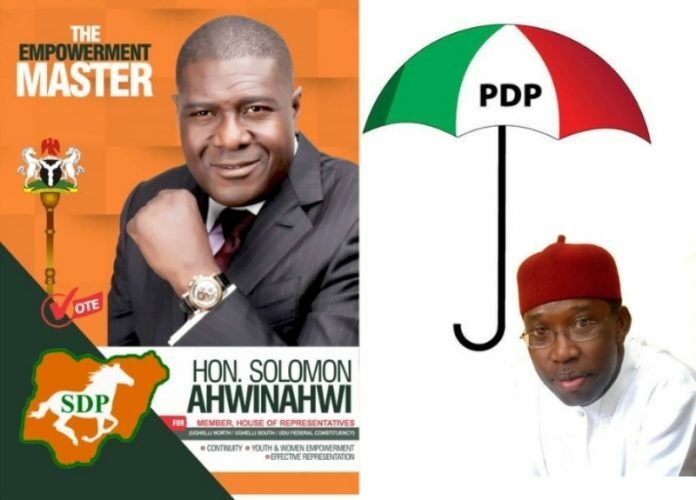 Awhinawhin in reacting to his loss took the decision of defecting from PDP to SDP as he is alleged to be furious with the party he placed full hope and trust on. Speaking exclusively to SecretReporters, the lawmaker who is accused of greed by seeking a third term in office further wailed that his defection was majorly to satisfy and represent his people in the House of Representatives. When asked if Mr Ifeanyi Okowa who governs the state gave him the nod to decamp, he stated that “Journalist, how can the governor who’s in PDP tell me to leave. My people want me to continue and I agreed yesterday (Sunday). Credible sources disclosed to this medium that Awhinawhi planned to defect to Accord Party but was advised against it; hence he left for SDP the same week he lost the primaries. His name has been with INEC since squealed the source.